A joint initiative by the Big Lottery Fund, the Calouste Gulbenkian Foundation (UK Branch) and Local Trust, ‘Creative Civic Change’ will support communities to address specific social issues and make positive changes in their areas. 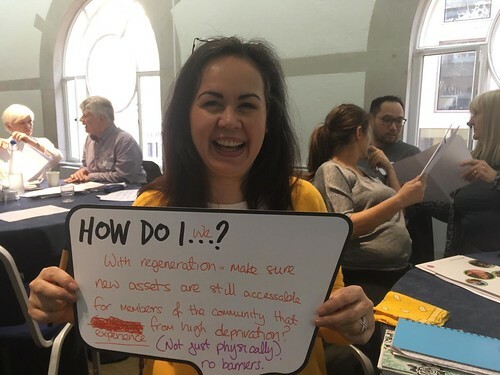 “Communities will take the lead,” explained Laura Drane, the Creative Civic Change programme manager. Creative Civic Change is open to areas across England that can demonstrate need such as having higher levels of unemployment, a higher proportion of children in poverty or lower levels of health compared to the general population. Establish new networks and connections amongst individuals and organisations interested and delivering in this space. Expressions of interest in Creative Civic Change opened today (23 July). The closing date is the end of September. From October, communities taking part will be designing their projects and have the opportunity to consider the support they need. At least 10 communities which receive funding will be announced in February 2019. Find out more information on the programme. The Big Lottery Fund uses money raised by National Lottery players to help communities achieve their ambitions. From small, local projects to UK-wide initiatives, the funding brings people together to make a difference to their health, wellbeing and environment. Since June 2004 Big Lottery Fund have awarded £8.5 billion to projects that improve the lives of millions of people. Local Trust was established in 2012 to deliver Big Local, a unique programme that puts residents across the country in control of decisions about their own lives and neighbourhoods. Funded by a £217m endowment from the Big Lottery Fund - the largest ever single commitment of lottery funds - it provides in excess of £1m of long-term funding over 10-15 years to each of 150 local communities, many of which face major social and economic challenges but have missed out in the past from accessing their fair share of statutory and lottery funds in the past. Visit www.localtrust.knightstudiosdevelopment.com. The Big Lottery Fund, the Calouste Gulbenkian Foundation (UK Branch) and Local Trust are working in partnership with at least 10 communities to deliver Creative Civic Change in 2018-19. The partnership will support communities to lead arts and creative projects that realise their own visions for their areas. The organisations share the belief that arts and creativity can be harnessed to engage, inspire and mobilise communities, and together they want to showcase the difference creativity and imagination can make, particularly in places which are often depicted negatively in the media.